Canadian jazz musician Oliver Jones retired last year and gave a farewell concert. 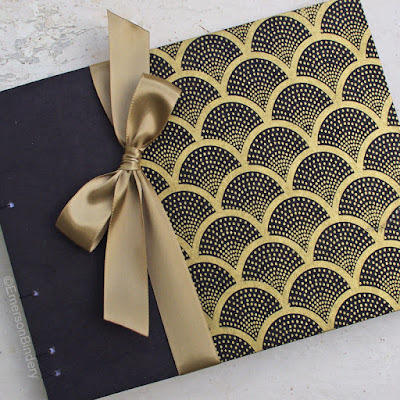 I was honored to provide two of my 6x4 Art Deco Advice Books to commemorate the occasion. Concert goers were invited to leave their thoughts and well wishes in the books. The notes of appreciation from fans for Mr. Jones's legacy of music and entertainment added a special touch to the celebration. I love this picture of Oliver Jones holding my guest book! What a treasure it will be for him to read through the notes and know what an impact he had on his fans. Read more about the musical farewell tour here. Handmade items can add a personal touch to your themed wedding. As you capture memories from your big day, your guest book will be among the few things you will have as a keepsake. 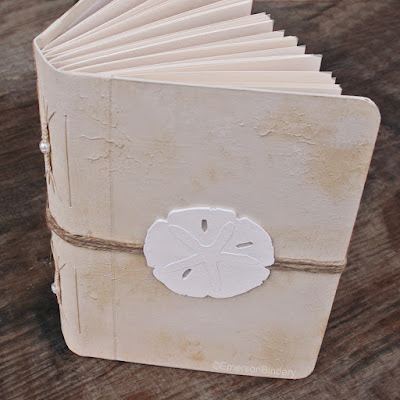 Here are three reasons to consider a handmade guest book for your wedding. 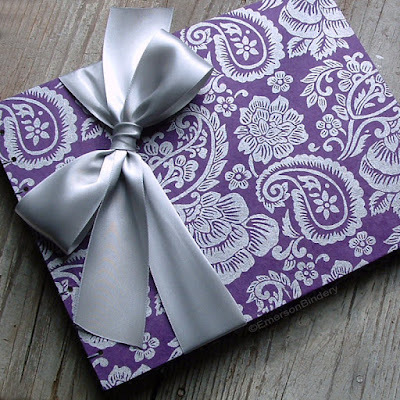 Silver Paisley on Purple Guest Book: great for a purple, Indian, or paisley themed wedding. Or have something made especially for you. 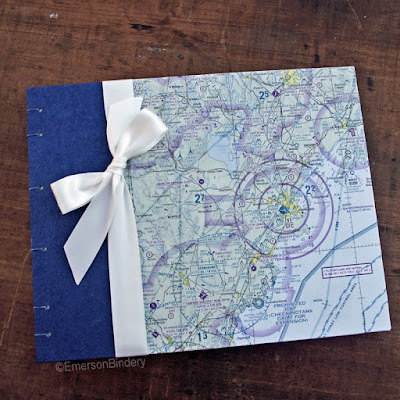 This customer and her fiance are pilots and wanted their guest book covered with aeronautical charts. She sent me the paper and I used it on both the inside and outside covers. 2. 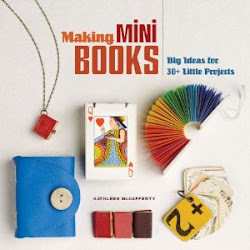 You can personalize your book with a name plate or personalized page using whatever text you want. Many couples put their names and the wedding date but some want a favorite scripture or quote also. 3. 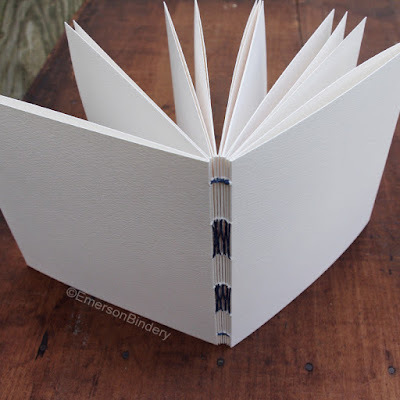 A handmade guest book offers you flexibility with the pages. Do you want black pages? 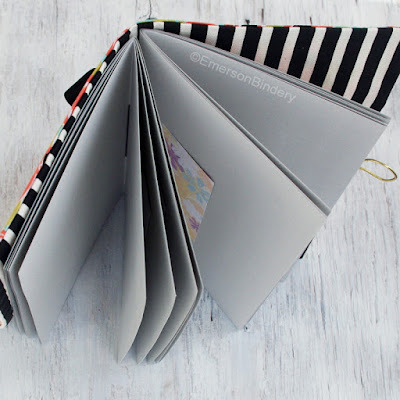 Fewer lined pages and more photo pages? Or all photo pages for a photo booth? I offer all these options for most of my guest books. Make your wedding day special with a handmade guest book you will treasure for years to come! Dare to Wreck This Journal! 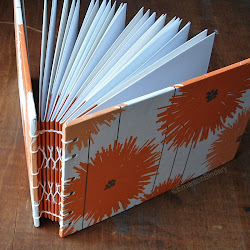 I came across a book by Keri Smith called "Wreck This Journal". In it she encourages artists to explore and be fearless of mistakes. When I first started keeping an art journal I was afraid of "messing it up". I overthought my pages and found it paralyzed my creativity. 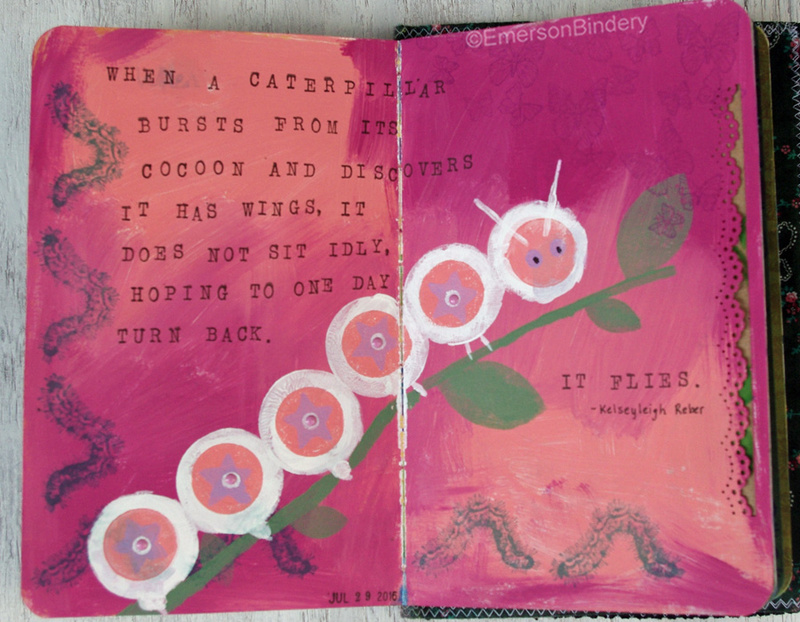 I overcame that fear when I actually did mess up a page by dropping an inked stamp. It landed where I didn't want it, of course. I faced the challenge of trying to "fix" the mistake. Once these random mistakes happened a few times (dripping paint unintentionally, misspelling a word, etc.) I became more confident in my ability to roll with it. In the page above, I misspelled "when" (how do you do that, right??!) so I just painted over the area. The ink beneath still shows through a little, but I've learned to tell myself it's okay! 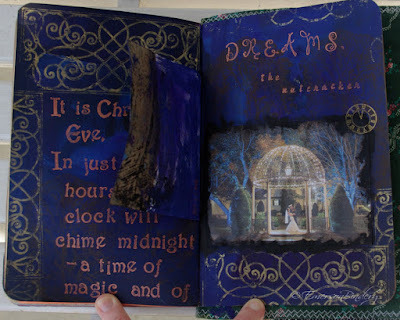 So my challenge to you is dare to wreck this journal! You can find it in my shop here. Considering an Art Deco theme for your wedding? Step back in time with a Gatsby, roaring 20's style and make it an unforgettable one for your ceremony and/or reception. Each of these items can help make your wedding day special and leave a lasting impression with your guests. Feeling overwhelmed planning your wedding? You may have heard the saying, "How do you eat an elephant?" One bite at a time! A good wedding planner breaks the process down for you into manageable steps. Here are few things to remember when tackling this. Establish a timeline to help manage the process. Most start a year in advance with quarterly, monthly, and weekly tasks. Many vendors will need to be secured months in advance. Rely on your vendors to help guide you through the process. This may be your first time but they do it all the time and will be able to tell you what questions you should be asking. If you're fortunate enough to have family and friends willing to help delegate specific tasks to them. Follow up to keep them accountable for the items on which they are responsible. Don't forget about post-wedding checklist items. Dealing with the aftermath of the wedding festivities involves thank you notes, following up with vendors, and preserving your wedding gown. 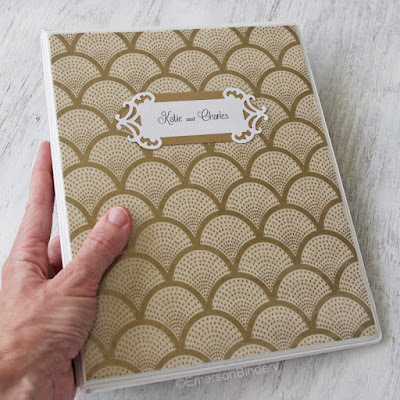 I designed my wedding planner binder to help keep you organized throughout the process. It includes suggested questions to ask when interviewing vendors and venue sites, checklists broken down into monthly tasks (and weekly/daily tasks as the big day gets closer), and a place to keep notes, brochures, business cards and fliers. 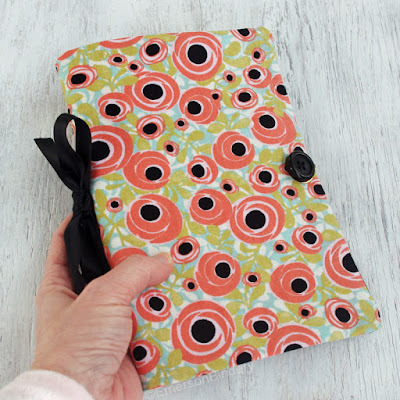 Everything you need to get started is all within this stylish and practical 3-ring mini binder which is the perfect size for carrying to appointments. I miss that magical time as a kid waiting for Santa, listening for reindeer hooves on the roof. It's fun to relive it through your kids, but now as mine is older I miss it again. 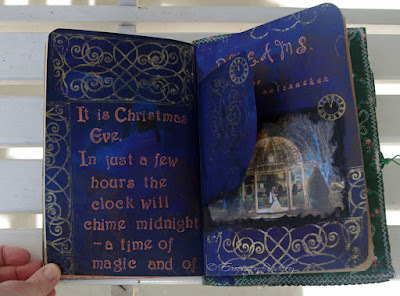 I used black gesso for the background with a coat of blue acrylic paint. 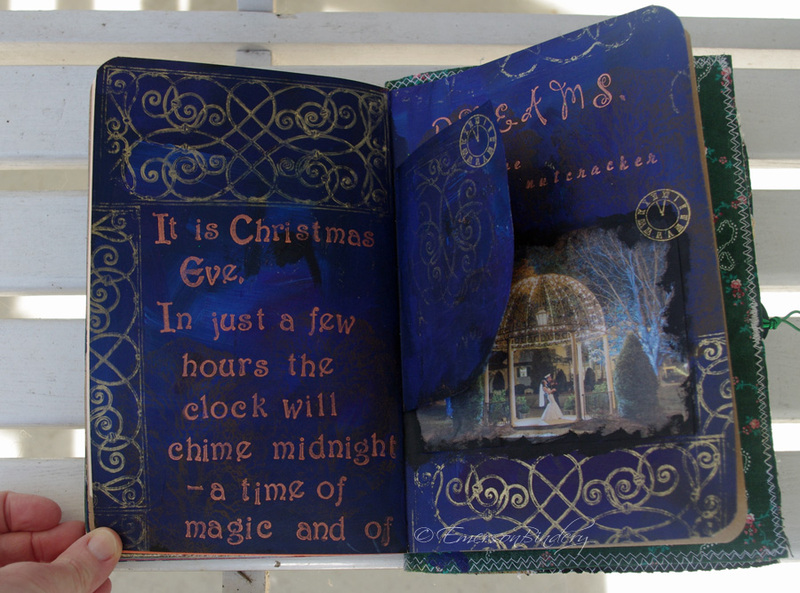 I stamped a tree in brown acrylic paint in the background and accented the page with swirls stamped with Brilliance gold ink. The words are in Brilliance copper ink. The wedding photo was taken by a friend of ours, Mark Collie who owns Quiver Tree Photography. It is so beautiful and magical, it looks like something out of a fairy tale! I am a bookbinder and mixed media artist who who finds fulfillment in the creative process and experimenting with new media. 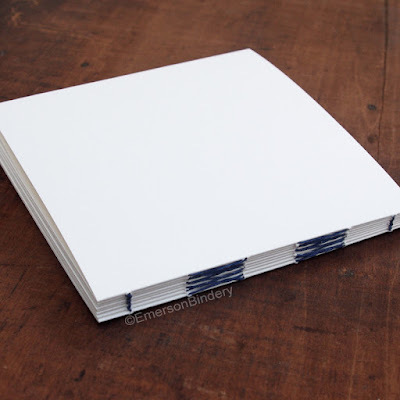 I keep busy with my middle schooler, two dogs, and preparing hand bound custom wedding guest books that have shipped all over the world. I love your comments and feedback! All content is copyrighted by the author. Please do not copy my original artwork or images from this site without my explicit permission. Thank you. MY WORK IS PUBLISHED HERE!